Today I went along to the McManus: Dundee's Art Gallery and Museum to visit the new exhibition of photographs of Queen Elizabeth II by Cecil Beaton. This is part of the programme of events organised by the V & A at Dundee. It is fair to say that I am not the biggest royalist but this is a really good exhibition. It is a beautifully staged exhibition. There are some really interesting photographs in the exhibition. These photographs tell us much about royalty, as well fashion and social history. The McManus is always worth a visit and this exhibition is well worth a visit. This is just a taster of what the V & A at Dundee could be like. Along with my Labour colleagues in the city we will work hard, with everyone with Dundee's best interests at heart, to help deliver the V & A at Dundee. You can see the BBC's report on the exhibition here. 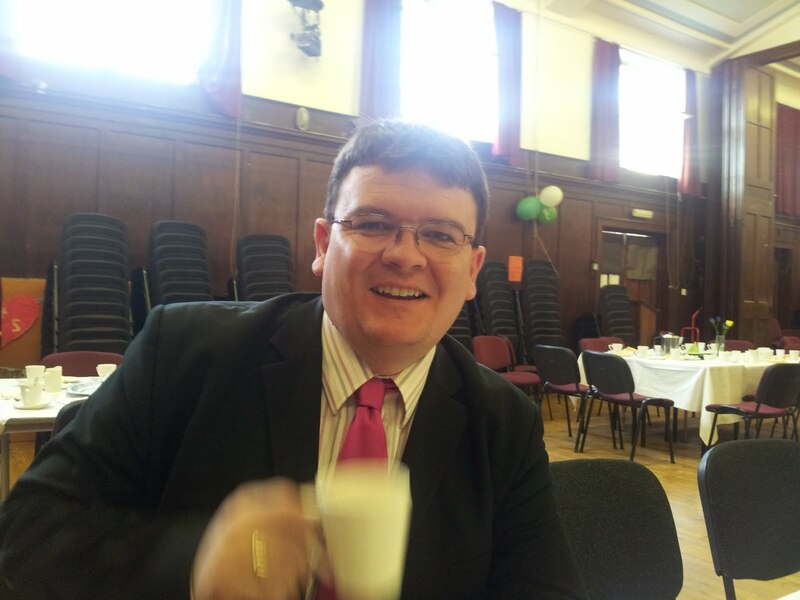 This morning I was delighted to go along to the Macmillan World's Biggest Coffee Morning which was hosted at Harris Academy. This was excellent event, there was some lovely baking which I believe had been baked in the Home Economics Department. It was great to see young people organising such a great event for such a worthy cause. It was great to meet some teachers and some sixth-year students and to enjoy wonderful coffee. Well done to everyone involved, if you click on the logo above you can find out more about the World's Biggest Coffee Morning, including how to donate. You can also see a picture of me finishing my coffee at the Harris this morning. School Heritage Trips- What about Dundee? I welcome the Scottish Government's announcement of continued funding for the Heritage Education Travel Subsidy. The Heritage Education Travel Subsidy provides support for schools to visit the Robert Burns' Birthplace Museum, the New Lanark World Heritage Site, Bannockburn and Edinburgh and Stirling Castles. All of these sites are well worth a visit but I wonder whether a broader approach should not be taken. I welcome this funding for historical trips, I think that all of these sites are well worth a visit. As a Labour and Co-operative Councillor I would particularly welcome visits to New Lanark to learn about the work of Robert Owen. However, I think that this list is too prescriptive and that schools should be allowed to decide which historical sites and museums they wish to visit. Schools should look at how this fits in with their locality and with the issues which they are studying. In Dundee I would say that you cannot understand our city without some knowledge of the jute industry. Therefore I would like to see Verdant Works included in this scheme. I will be writing to the Scottish Government asking that they look at broadening the criteria for this scheme. Today I attended the Annual General Meeting of the Dundee Carers Centre. I was very pleased to hear about the work of this organisation in the city of Dundee. Carers do great work in the city and contribute greatly to the city, and indeed save government at all levels money, but we need to ensure that they are given the right level of support which they need. I was delighted to attend the Dundee Carers Centre AGM today. It is important that councillors listen to the experiences and concerns of those who are carers in the city. Carers play a very important role in our city and their efforts play an important role in our city. Carers often need support to access other services or support for their own needs. Service providers, including the City Council, need to ensure that they are aware of the needs of carers and indeed of the problems that many of them face. There are particular issues which face the growing numbers of young carers and the council and others must be aware of these. The main point which I have taken away from today's meeting is that the City Council must be aware of the needs and concerns of carers. This awareness requires to be across a broader range of areas than just social work. It was good the representatives of the NHS recognised that it was important to look at a much broader picture than just the treatment of patients. The Dundee Carers Centre does a great job and I would be very happy to support them in their work in the future. Since the Scottish Election in May the Scottish Labour Party has been carrying out a review of our structures and looking at how we need to change to be closer to the people of Scotland. I have taken part in a number of meetings in this review and have written a submission to the review. I argued that Labour needed to devolve to the Scottish Labour Party all aspects of the party which are devolved to the Scottish Parliament. The election result was dreadful for Scottish Labour and it was clear that we needed to take a real hard look at where we go from here. On election night I said that Scottish Labour would regroup in Dundee and right across Scotland and that we would be back. I think that these changes are tentative steps on this journey. Changing structures will not win us elections in itself, but if we have the structures right it will certainly help us. The new leader of Scottish Labour will need to develop an effective policy and campaigning platform to take us forward. If people work hard and abide by the rules then Scottish Labour will be on their side, Scottish Labour will stand up for the people who do the right thing in our society. I'm looking forward to playing my part in renewing the Scottish Labour Party in Dundee and right across our country. My colleague Jenny Marra MSP has filmed a video diary with pupils from St John's High School to highlight the problems of getting from the West End to St John's High School. I share Jenny's concerns about the lack of action by the City Council on this important issue. In my opinion all these problems with bus services arise because of a lack of regulation in the bus industry. I hope that action will be taken sooner rather than later and hopefully before the dark winter nights and mornings come along. On Tuesday evening I attended a meeting of the board of Dundee Rep. This was somewhat different to normal board or committee meeting in that we were treated to a performance by Scottish Dance Theatre during the board meeting. I'm not sure that the City Council's Chief Executive will be putting on entertainment in the middle of council meetings any time soon. 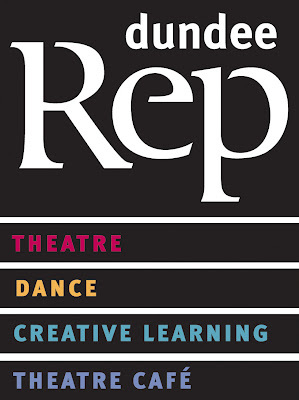 The board meeting heard about an exciting programme at the Rep over the next few months and also into next year. There was also very interesting news about the Pathways to the Profession Symposium which Scottish Dance Theatre is leading on. This will be held in Dundee in January and will look at the issues around routes into the performance arts for disabled people. This will build on the excellent work done at the Rep by the Dance Agent for Change Caroline Bowditch. I had the chance to see some of the work of Scottish Dance Theatre last week at the Great Big Dance Show where there was also performances from a wide range of other dance groups it was a really good event. At tonight's City Council meetings there was an emergency debate on the future of Dundee's universities. There was an excellent contribution to this from William Mohieddeen, President of the Students' Association at Abertay and Kev Rooney of the Save Abertay campaign as a delegation at the start of the discussion. The Labour Group put forward a proposal as did the Liberal Democrats, the SNP put forward a motion which did not go as far as the Labour and Liberal Democrat amendments. Many SNP members said that there were no proposals to merge the universities, if they really believed this it begs the question why on earth had they brought forward an emergency motion on the issue. Some also claimed that Labour had made up claims that there was pressure being put on the universities to merge. Clearly this ignores the extensive press coverage over the last few days and indeed a statement by Joe FitzPatrick MSP when he said, "Abertay should be given the time and space to discuss with Dundee University what options there are to secure a bright future for higher education in the city, which ensures the continuation of the Abertay brand, maintains student numbers, course choices and the quality teaching and research the city is known for. “There is clearly an opportunity and imperative to look at the merger of a number of functions to preserve the front line offer to students in Dundee. It is clear that nobody at either Dundee or Abertay initiated this process, this is a top down agenda. The Council should be standing up for the city and putting the interests of the city first, I don't think that a merger of the universities does this. Ideas such as sharing a principal just don't preserve the autonomy of the universities. City Councillors would not accept a joint Chief Executive between Dundee and for example Perth and Kinross Council. The City Council recognises that it would be highly detrimental to the City of Dundee if the University of Dundee and the University of Abertay Dundee, were forced to merge. The City Council further recognises that both our universities are dynamic institutions but their focus is rightly different and they complement one another. That would be lost by a forced merger, with a detrimental impact on the availability and diversity of course provision. 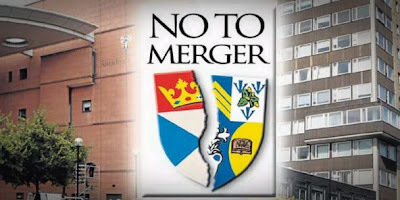 Dundee City Council makes clear its outright and unequivocal opposition to the merger of the University of Dundee and the University of Abertay Dundee. It therefore instructs the Chief Executive to write to the Cabinet Secretary for Education and Lifelong Learning, Mike Russell MSP, to the First Minister, Alex Salmond MSP and to the Chief Executive of the Scottish Funding Council, Mark Batho, making clear the City Council's outright opposition to a merger of the University of Dundee and the University of Abertay Dundee." The SNP Group forced through their motion with a slight amendment, which is below. At least they have stated clearly that they want the universities to continue as autonomous institutions. "The Council strongly supports the continued status of Dundee and Abertay Universities as independent autonomous institutions. The Council further notes that all public sector institutions are operating in a period of severe financial constraint as a result of Westminster government policy and considers that the strong case for retaining both institutions can be greatly enhanced by closer mutual working relationships." They will also write the Education Secretary, the First Minister and the Chief Executive of the Scottish Funding Council. It was a shame that the council did not speak with one voice and that a genuine cross-party amendment was rejected in favour of a motion which includes petty party political posturing, I am no fan of the current Westminster government but it is far more important that we support Dundee's universities rather than make political points against the UK Government. Monday evening saw meetings of Dundee City Council's Education, City Development, Social Work and Health and Policy and Resources Committees. The Education Committee discussed proposals for a consultation on proposed changes to the secondary school timetable across the city. The idea is that there should be a common timetable across all of Dundee's schools. These are interesting proposals but, as ever, the devil will be in the detail. I hope that parents, staff and pupils will make their views heard on this important issue. Among the plans would be two different school days, three days on one timetable and two on another. I am concerned that this will create problems for parents. I also raised concerns that if problems can happen in getting public transport to St John's High School, as happens at the moment, will there be effective consultation with public transport providers and the City Development Department to ensure that bus services work with schools after any changes. The Convener seemed to think that this was an outrageous suggestion despite the fact that the Director had included discussing with National Express Dundee and Strathtay Buses in his report. The Catholic Church's representative on the Education Committee was ruled out of order for having the temerity to raise his concerns about public transport to St John's High School and St Paul's Academy. There is some merit in these proposals and it is clear that everyone involved in education in the city should make their views known. It is also incredibly clear that the City Council should be looking at what it can do to deliver an effective bus service for West End pupils attending St John's High School. At the City Development Committee I was pleased to welcome news that the council is making progress towards building a bridge which will link the West End with the waterfront close to the former Homebase site. This is good news but is still quite some way off in terms delivery. The City Development Committee also agreed changed priorities in terms of winter maintenance which I discussed last week.